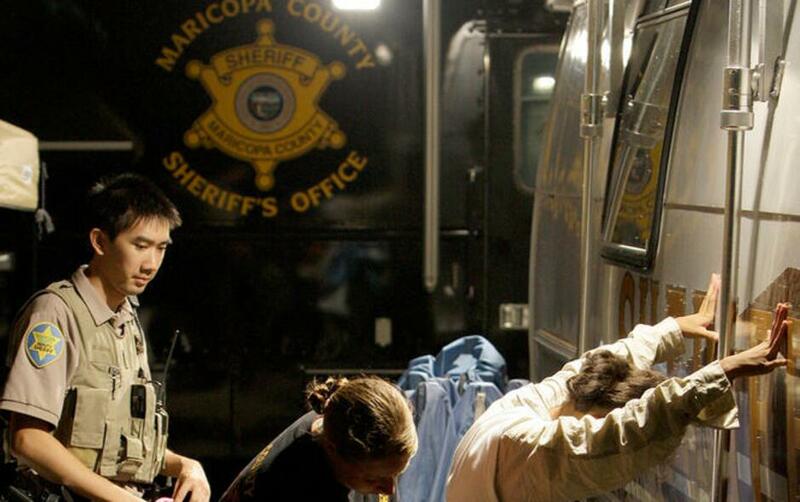 Maricopa County Sheriff's deputies process a suspect brought in during an immigration and crime suppression sweep in Phoenix. President Donald Trump plans to revitalize a long-standing program to deputize local police officers to enforce federal immigration law. 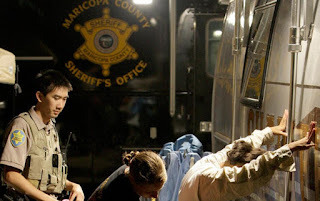 The program was used in the past by Joe Arpaio, then sheriff of metro Phoenix, to conduct immigration patrols that were later discredited in court. PHOENIX (AP) — To build his highly touted deportation force, President Donald Trump is reviving a long-standing program that deputizes local officers to enforce federal immigration law. The program received scant attention during a week in which Trump announced plans to build a border wall, hire thousands more federal agents and impose restrictions on refugees from Middle Eastern countries. But the program could end up having a significant impact on immigration enforcement around the country, despite falling out of favor in recent years amid complaints that it promotes racial profiling. More than 60 police and sheriff's agencies had the special authority as of 2009, applying for it as the nation's immigration debate was heating up. Since then, the number has been halved and the effort scaled back as federal agents ramped up other enforcement programs and amid complaints officers weren't focusing on the goal of catching violent offenders and instead arrested immigrants for minor violations, like driving with broken tail lights. The longtime sheriff used the authority to carry out traffic patrols that targeted immigrants. The patrols were later discredited in a lawsuit in which a federal judge concluded Arpaio's officers had racially profiled Latinos. The lawsuit so far cost county taxpayers $50 million. When asked to comment on Trump's effort to revitalize the program, a Department of Homeland Security spokeswoman said the executive orders would speak for themselves. Traditionally, police stayed out of immigration enforcement and left those duties to federal authorities. But a 1996 federal law opened up the possibility for local agencies to participate in immigration enforcement on the streets and do citizenship checks of people in local jails. Immigration and Customs Enforcement trained and certified roughly 1,600 officers to carry out these checks from 2006 to 2015. The Obama administration phased out all the arrest power agreements in 2013, but still let agencies check whether people jailed in their jurisdiction were citizens. If they find that an inmate is in the country illegally, they typically notify federal authorities or hand them over to immigration officers. Today, more than 30 local agencies participate in the jail program. Alonzo Pena, a retired deputy director of U.S. Immigration and Customs Enforcement who once oversaw such agreements with police agencies, said some officers were using the authority in ways that didn't match the agency's enforcement priorities. "The window has narrowed to a large extent," said Orange County sheriff's Lt. Mike McHenry. With Trump in office, the program has new life. Even before the change in administration, two Republican county sheriffs in Massachusetts said they were starting programs. In Texas, Jackson County sheriff A. J. "Andy" Louderback said two officers will get trained to run immigration jail checks this spring and nearby counties want to follow suit. Louderback said teaming up with federal agents will cost his agency roughly $3,000 — a small price to pay to cover for officers while they're on a four-week training course, especially in an area struggling with human smuggling. Once the program is underway, he said immigration agents will send a daily van to pick up anyone flagged for deportation from jail. "It just seems like good law enforcement to partner with federal law enforcement in this area," he said. "It takes all of us to do this job." Experts said Trump's outreach to local law enforcement will create an even bigger split between sanctuary cities that keep police out of immigration enforcement and those eager to help the new president bolster deportations.